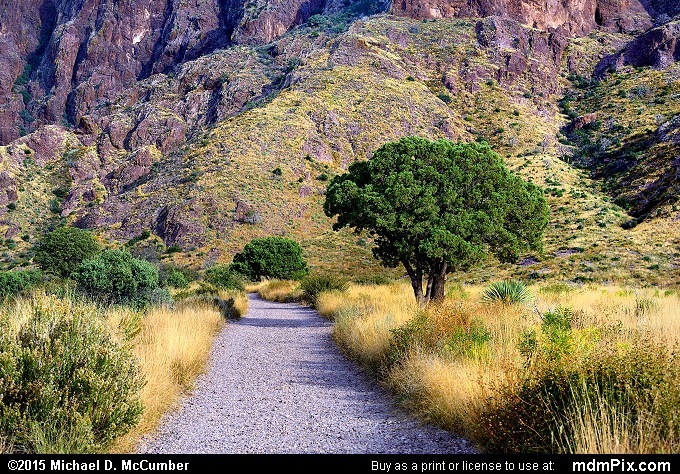 The Drippings Springs Trail is featured as it meanders through lush grassland and several kinds of shrubs along with an Alligator Juniper while the background dominates with the sheer cliff faces of igneous rock and rise of the Organ Mountains just east of Las Cruces, New Mexico. The trail leads to a canyon with the remnants of a Cox Ranch, Van Patten Mountain Camp, and Boyd's Sanitarium. 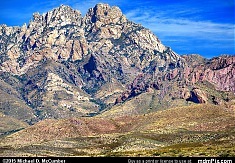 Baldy Peak at 8,445 feet is a prominent mountain of the Organ Mountains in this location.